Dr. Tom McLarty was not only a successful farmer, but he pioneered laparoscopic surgery in Canada as a progressive doctor. 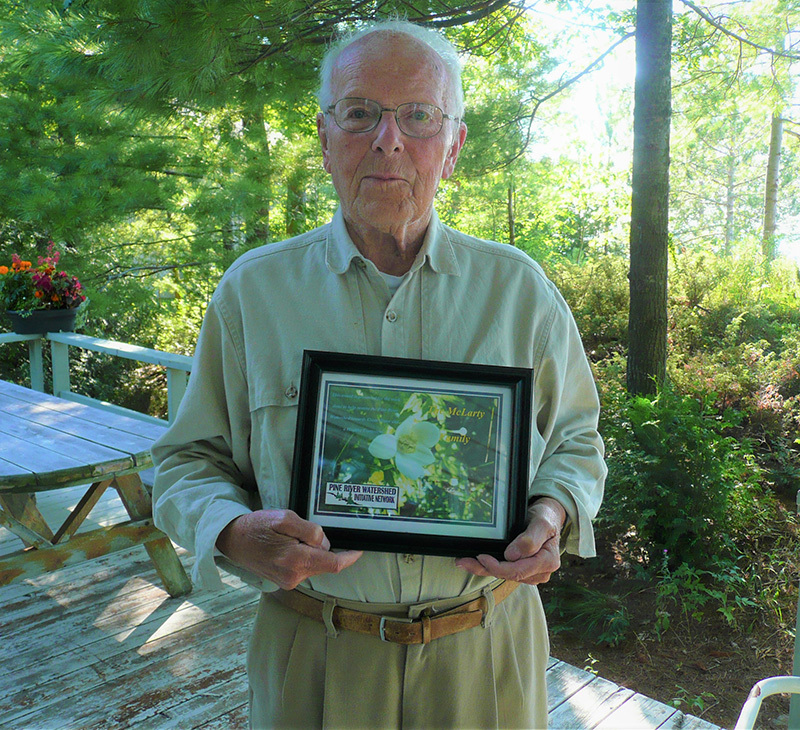 Dr. Tom McLarty purchased the family farm here in the Township of Huron Kinloss in 1962 and enjoyed most summers driving the combine, and growing vegetables and flowers. In 2013, Dr. McLarty and family donated fourteen acres of Pine River Flats from their beloved farm to the Pine River Watershed Initiative Network for the creation of the McLarty Environmental Study Area (ESA). This area is designed for students to learn about the Pine River; wetland creation; and the education of the local wildlife and plant communities that this area supports. It remains the desire of the McLarty’s to restore and preserve this piece of the river flats for generations to come. In an interview in 2013 with the Saugeen Times, Dr. McLarty said “We all have to do something. If everyone did a little more, we might stop some of the damage we’re doing to the planet”. The McLarty ESA is located on Bruce Road 6/side road 20 in Huron Kinloss. It is open to the public. Since being gifted the fourteen acres from the McLarty’s, PRWIN has installed a gravel trail system throughout the area, created two wetland ponds, and planted over a thousand tree seedlings. The Ripley 4H Conservation Club have built numerous birdhouses, and the Huron Kinloss Jr. Horticultural Club plants many species of pollinators annually. Students from Port Elgin to Lucknow have enjoyed outdoor classroom experiences at the McLarty ESA. PRWIN strives to find annual funding for busing and port potty rentals for classes to participate in these valuable field trips. Please click on the link Projects and Program/Programs (Education and Outreach Programming: McLarty ESA for Outdoor Classrooms) to see how local youth can experience this opportunity! Doctor Tom McLarty passed away February 19th 2017 in London, ON. Thank you Dr. Tom McLarty and Family for your invaluable contribution to our mission of “Clean water and a healthy ecosystem within the Pine River watershed”. Your legacy lives on.